finding out it wears black and gold. that there's much more behind it. think, years from now, we will be talking about the St. Joseph's win in the same way we talk about the Mike Doles Game. it was the loudest they'd ever heard the Siegel Center. I couldn't tell you. I was too busy regaining my composure. It was but the latest–and loudest–lightning strike for the Rams late Thursday night. rebound, necessitating a walking call. That was all it took. 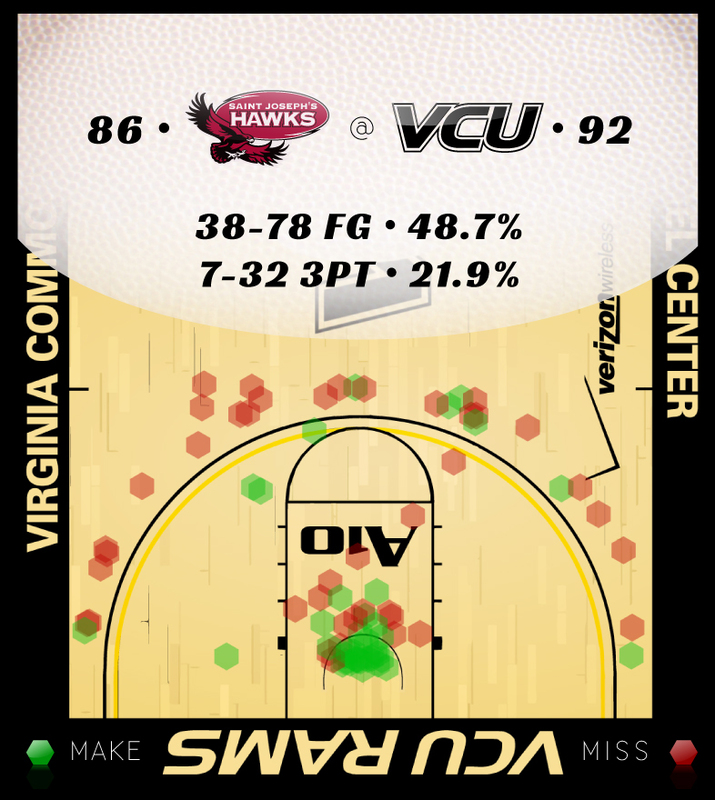 VCU came out of a timeout and ran a curl screen play for Rob Brandenberg, and Brandenberg was open. was probably the millionth correct decision Theus made on the evening. Theus, who scored 22 points on the night, followed his comment by saying: "Troy, Rob, Tre, Ju…it doesn't matter. I don't have to score when I have so many great scorers to pass to." that didn't think the Rams were going to win running away in overtime? minutes to go in the first half when the throttle opened. possessions, hit a bucket, and then had 11 more empty possessions. The summary: 1-14 from the field with six turnovers. 14:20. The remainder of the game looked familiar–eight minutes of garbage time. It was a night of milestones. (211), Brad Burgess (231) and BA Walker (269). for 30th fastest in division one college basketball history. Smart's response is both magnanimous, and unsurprising. be the best individual performance of the year. Check that: this was better. Aiken) and a second big (Ronald Roberts) who is awfully good. *Treveon Graham. The Freight Train hit big shot after big shot, in big circumstances. Graham was 4-7 from three. 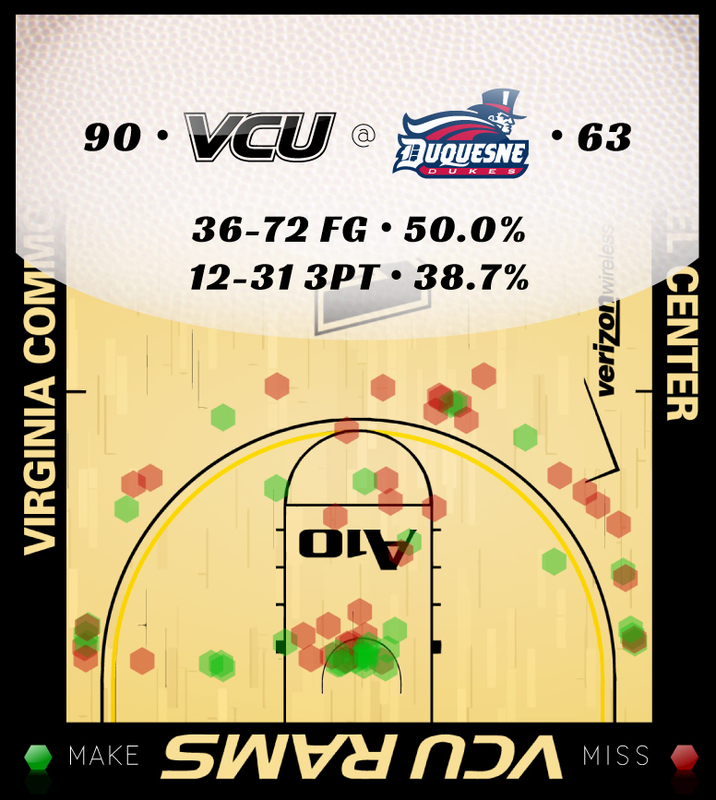 All other VCU players were 3-25.
awhile, too. His 22 points were one off a career high. the game's first nine minutes. and Haley took two charges.